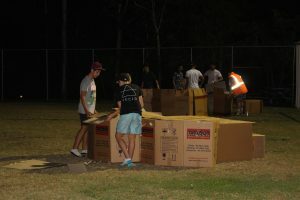 On Friday 10th March, more than 50 staff and students from Years 7-12 spent the night camped in cramped cardboard boxes. Taking to their sleeping bags under the full moon, Westside students were asked to imagine: ‘how many of us are just one small step away from homelessness?’ It was a thought that made them shiver. According to Queensland Council of Social Service, Ipswich makes up 3.2% of Queensland’s homeless population. Many of these people are young. Westside Christian College students prepare makeshift shelters. Beginning with a free-dress day, the night under the stars began with students receiving a flat-packed cardboard box. With limited supplies, they had to assist one-another to build suitable shelters for themselves and their belongings. Afterwards, they shared a meal together. Through dramas and games, students were encouraged to be voices for the voiceless and not to overlook people in their own communities. Ipswich Assist provides help, hope and support to the people of Ipswich. The organisation specialises in emergency relief, food parcels, counselling, budgeting and meeting immediate expenses. According to State of the Children and Young Persons’ Report 2014 Ipswich and West Moreton, 30% of children in Ipswich live in low income, welfare dependent families. The same report shows that one in ten families in Ipswich with dependent children have a household income below the poverty line.